So if you haven ‘t had miso before, please try some! It is so SO delicious. Miso is a rich, salty condiment which is used a lot in Japanese cooking. It is generally made from soy beans, salt and a type of grain. Sometimes other grains are added, such as barley or brown rice. I use a barley miso in this recipe. Miso is made by fermenting the ingredients together. The lightness of the miso is an indicator for how long it has been aged. The lighter the miso, the less time it has been aged! You can add miso to SO many things. You can use it in soups, or glazes (as I do here) – you can also add it to things like stews and it kind of gives dishes this umami savoury flavour. I find that it makes a great substitute for anchovies in some dishes! You could use different vegetables with my miso glaze. However, I think that aubergines are the best choice. The trick is to roast them in a drizzle of oil before hand and then roast them glazed for the last ten minutes. It is a super quick recipe, perfect for a mid-week supper! Because the glaze is so flavoursome, I found a plain side dish works best with it. I used brown rice, but quinoa or millet would also work well! Here is how I did it! This recipe serves two! 2 aubergines slices length ways in half. 1 tsp Chinese five spice. To serve: brown rice, millet or quinoa. 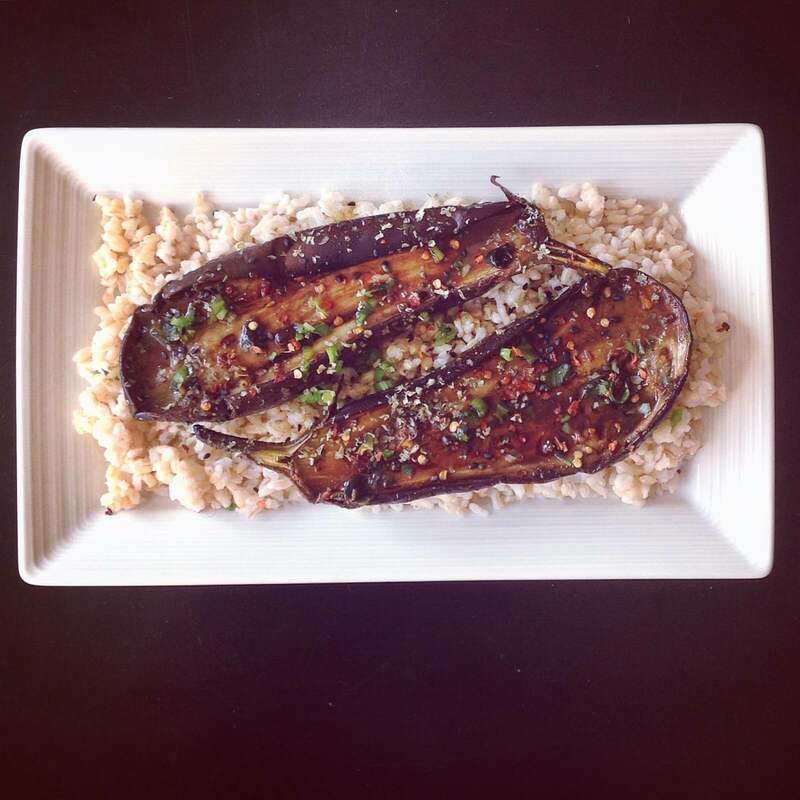 Lay your aubergines onto a baking tray, drizzle with olive oil and season with salt and pepper. Roast for 20 minutes. Whilst your aubergines are cooking, make your glaze. Add the honey, miso, chilli flakes, rice vinegar, soy sauce, Chinese five spice and spring onions into a bowl. Mix well and set aside. Once your aubergines are turning a nice golden brown and the flesh begins to soften, pour the glaze over the slices. Ensure that all slices are evenly coated. Roast for a further 10 – 15 minutes until the glaze begins to caramelize. Serve with brown rice, scatter your favourite toppings and enjoy. How easy was that?? 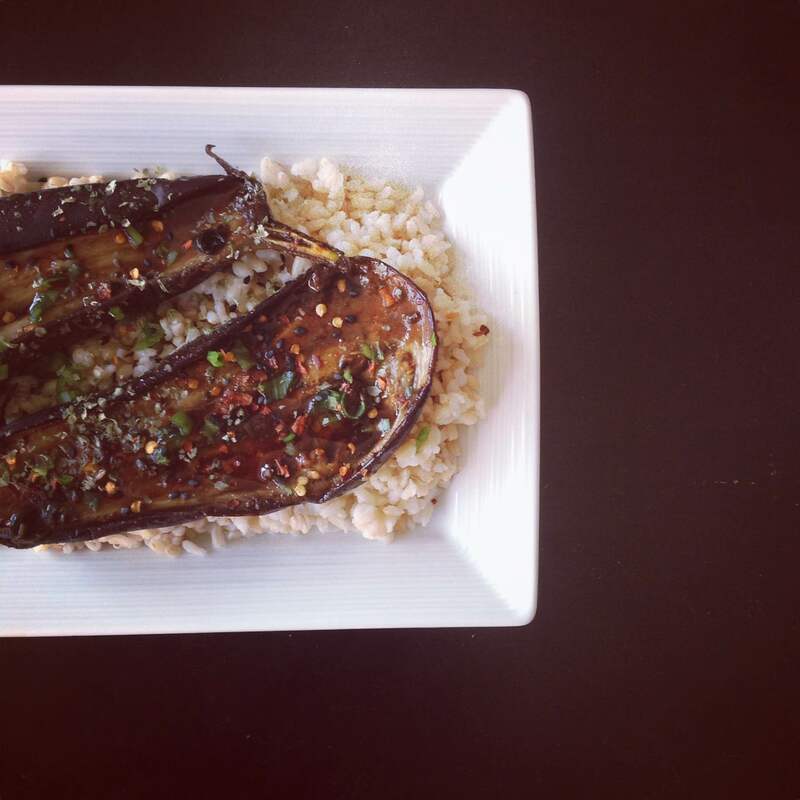 Posted on September 13, 2015 January 6, 2016 by TinaManahaiPosted in Dinner, RecipeTagged anytime, asian, aubergine, dinner, Healthy, lunch, miso, recipe, Vegetarian. So laying my hands on some Miso tomorrow! This sounds so delicious! I love aubergine so much!